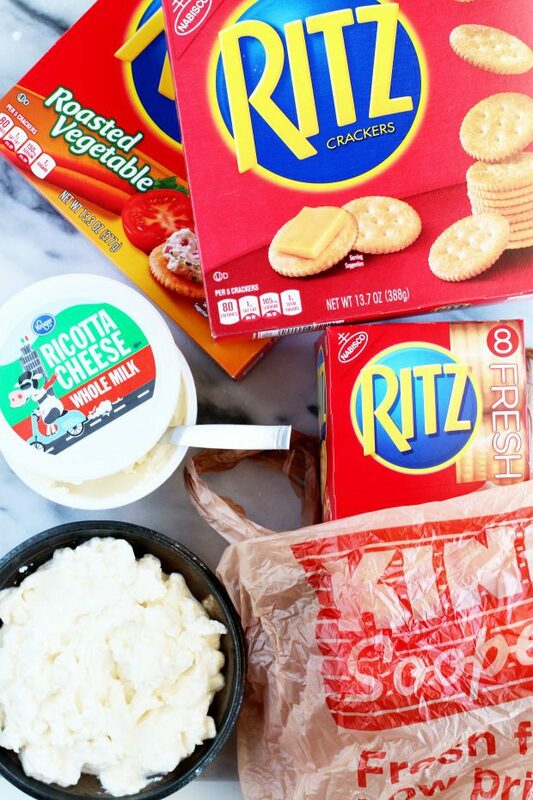 Anytime is a good time to bust out this easy peasy RITZ Cracker Ricotta Toppings Bar! 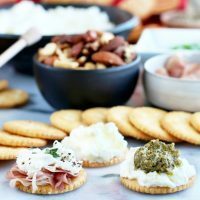 Whether you are planning a party or have a last-minute gathering drop in your lap, this spread of sweet and savory toppings featuring creamy ricotta and RITZ Crackers is just the simple elegance everyone will love. Disclosure: This post has been sponsored by RITZ. All thoughts and opinions are my own. 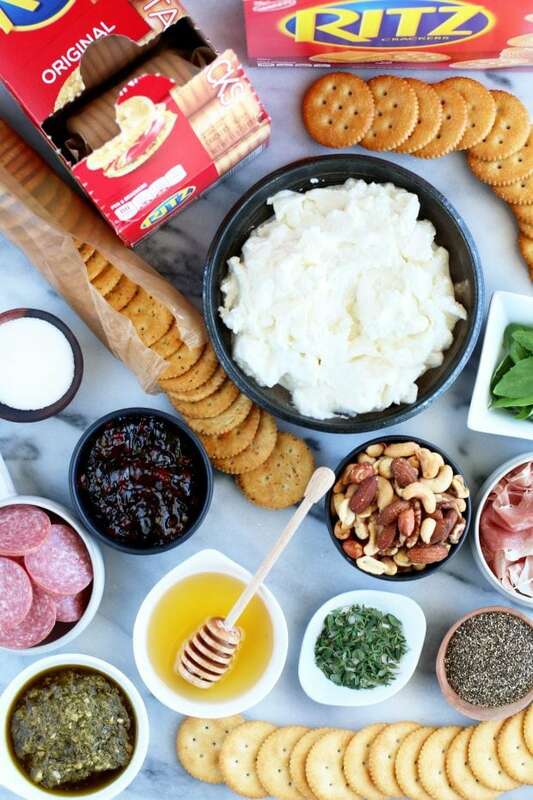 The one thing I love when it comes to snacking is a varied spread of textures and flavors. I am what you would call a classic “grazer” – one of those people who would much rather have a little bit of this, a little bit of that, and a whole lot of other things to satisfy my daily hunger. Another thing I am? A gatherer. Gathering people around food and drink is just what I do. 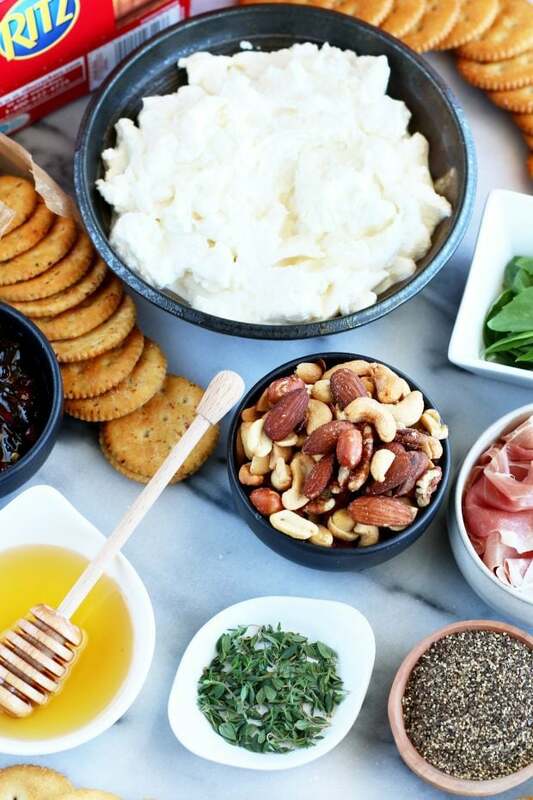 Whether it’s a planned party or a last-minute impromptu drop-by with my friends or my mom, I love to make the centerpiece of any get-together some sort of delicious meal or snack. Having something like this oh-so easy RITZ Cracker Ricotta Toppings Bar in your back pocket is a MUST for anyone. I mean, you are busy enough with work, obligations, dealing with fur babies (or actual babies), and more, aren’t you? That’s where the magic of RITZ Crackers and ricotta comes in. Both are easy items to keep in your pantry and fridge at all times, and my guess is you have at least half of the other ingredients on hand at various times. Personally, I love having a variety of RITZ Crackers on hand at all times. My favorites include RITZ Crackers Original and RITZ Crackers Vegetable. 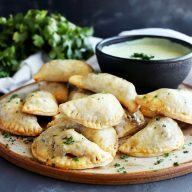 They are all varied in flavor and really bring something unique to this spread of deliciousness so you have enough differentiation for all your grazing pleasure. 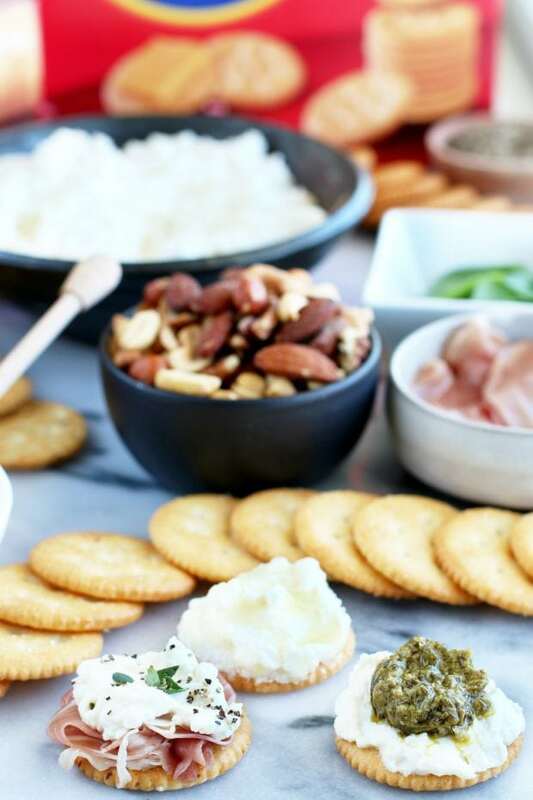 With a spread of rich and creamy ricotta, your family and friends can top their crackers with exciting combinations like honey and nuts, fresh herbs and prosciutto, and even the pure tasty simplicity of olive oil, salt and pepper. And where can you get all this magical deliciousness? At your local Kroger store! For me, shopping at King Soopers is a weekly ritual. Whether I am going into the store to peruse the aisles or doing a large online order with their fancy ClickList option, King Soopers makes it easy to shop for everything you need. Oh and did I mention all the incredible savings you can get through Kroger? It’s pretty insane how much I’ve saved, simply by using their digital coupons and loading them to my King Soopers card. No more clipping coupons for me! Especially with the Kroger brands, like their Kroger ricotta that you can find over by the milks. Then simply cruise over to the cracker aisle to pick up your RITZ Crackers in any flavor you choose! Your carefree gatherings are covered with all this goodness. Be sure to head over to Kroger’s site now so you can start saving! 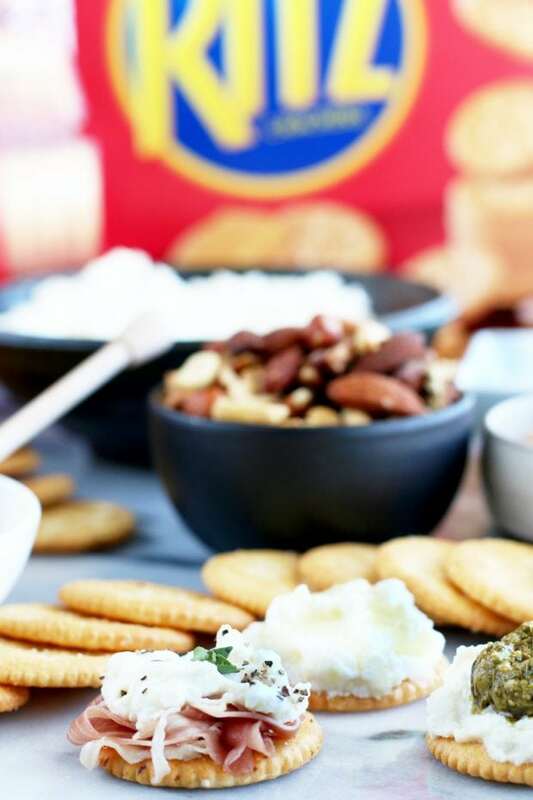 Pin this RITZ Cracker Ricotta Toppings Bar recipe for later! 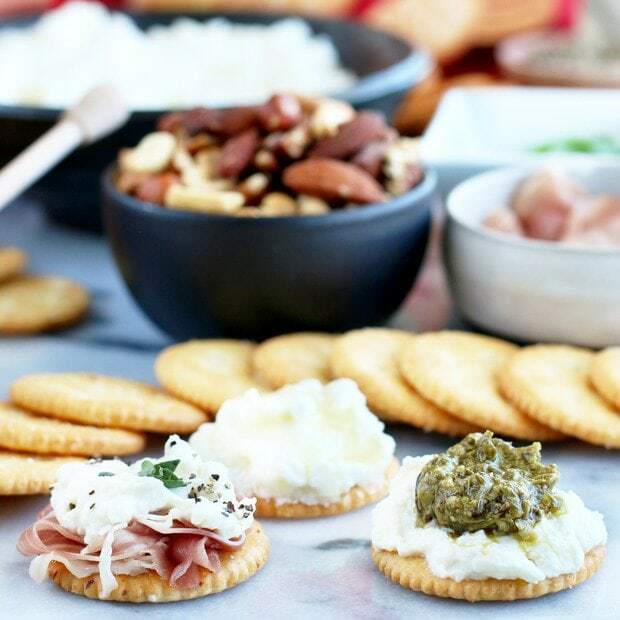 Whether you are planning a party or have a last-minute gathering drop in your lap, this spread of sweet and savory toppings featuring creamy ricotta and RITZ Crackers is just the simple elegance everyone will love. Add ricotta to a bowl with a serving spoon. Place on a serving platter. 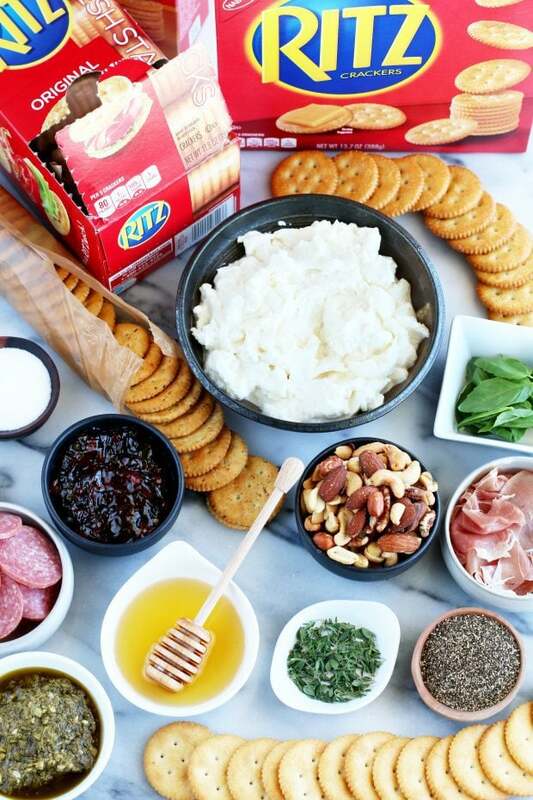 Surround the bowl of ricotta with RITZ Crackers in a variety of flavors. Add various toppings to bowls and arrange on the serving platter as desired. 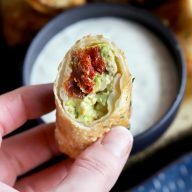 This looks like the perfect appetizer! YUM! Love Ritz crackers! I will have to try this! What a great idea for when you are entertaining guests! 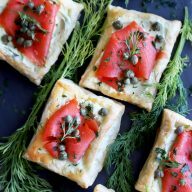 This is so fun and so perfect for entertaining! Can’t go wrong there! Look perfectly delicious! Such a great snack idea! I love Ritz, so fun and yummy! What a fun snack bar idea!